Having a healthy mouth and teeth contributes to your overall health. Looking after your teeth by brushing twice a day and seeing your dentist regularly is an important part of looking after yourself and is even more important as you get older. If you’re caring for an older person, don’t forget the contribution good dental health can make to their comfort, nutrition, health and wellbeing. If you have pain in your mouth, swelling, or discomfort from your teeth, it’s important to talk to your dentist or GP. Don’t put it off. If you notice changes to the way your mouth and teeth feel or look, it’s also important to seek treatment. If you’ve had good dental habits all your life, it’s important to keep it up. However, it’s never too late to develop better habits around dental hygiene. Brushing and flossing removes plaque and tartar from teeth to prevent gum disease and tooth decay. Severe gum disease causes at least one-third of adult tooth loss. After brushing your teeth swish and spit but don’t rinse. Arthritis and other mobility issues may make it difficult to brush and floss. An electric toothbrush may make this easier. If you are having trouble, talk to your GP or dentist. If you're receiving care at home (or in an aged residential facility) you may be able to ask your carer to assist. Clean your mouth after removing your dentures using a soft toothbrush. Brush your dentures at least daily. Soak your dentures in water overnight. This helps to keep their shape. Mouth ulcers are small sores that develop in your mouth. These are quite common and generally go away on their own. If you have ulcers that are very painful, that are stopping you eating or drinking the foods you usually like, or that have lasted more than two weeks, it’s important to see your dentist or GP. A yearly dental check-up can help maintain the health of your teeth and deal with problems at an early stage before they become severe. There are many things a dentist can spot during a dental check-up such as cavities, early signs of gum disease, and other oral problems that can affect your general health. Dental treatment can be expensive, however, seeing a dentist for regular check-ups will save you a lot of money and trouble, and will help to keep your teeth looking good and working well. Subsidies may be available to help pay for dental treatment. It’s important to discuss with your dentist how much any treatment is likely to cost and which subsidies you can use. You may be able to pay off the cost of treatment. The Canterbury DHB funds emergency dental care for low-income adults. If you're in pain, or have swelling or an infection in your mouth, subsidised emergency treatment is available through a number of private dentists for older adults with a Community Services Card. New Zealand residents over the age of 65 are able to attend the Relief of Pain Clinic at the Hospital Dental Service . Younger adults receiving a full WINZ benefit may also be eligible. Phone (03) 364-0250 to check eligibility. The Hospital Dental Service is located at 2 Oxford Terrace. 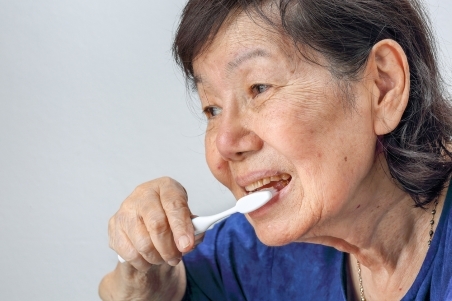 Oral health guide for caregivers of older people. Receding gums is common in older people. Using a soft-bristled brush can help address root decay early.